Surveys are a valuable source of evaluation data. Obtaining quality data relies heavily on well-crafted survey items that align with the overall purpose of the evaluation. In this webinar, participants will learn fundamental principles of survey question construction to enhance the validity and utility of survey data. We will discuss the importance of considering data analysis during survey construction and ways to test your survey questions. 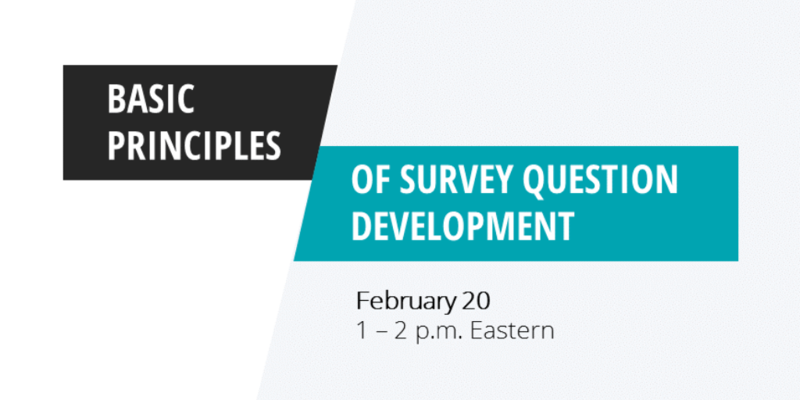 Participants will receive an overview of survey do’s and don’ts to help apply fundamental principles of survey question development in their own work. During the course of evaluating the sustainability of NSF’s Advanced Technological Education program, I introduced a new method for creating evaluation surveys. I call it a Peer-Generated Likert Scale because it uses actual statements of the population of interest as the basis for the items on the survey. Listed below are the steps one would follow to develop a peer-generated Likert-type survey, using a generic example of a summer institute in the widget production industry. 1. Describe the subject of the evaluation and the purpose of the evaluation. 2. Define the domain of content to be measured by the survey. 3. Collect statements from the participants about the activity related to those domains. a. Please list three strengths of the summer institute. b. Please list three limitations of the institute. 4. Review the statements, select potential survey items, and pilot the survey. These statements are then reviewed by the evaluation team and selected according to their match with the elements of the domain. They are put in a Likert-type format going from Strongly Agree, Agree, Uncertain, Disagree, to Strongly Disagree. You can plan that response time will be about 30 seconds/item. Most surveys will consist of 20 – 30 items. 5. Collect data and interpret the results. The survey I developed for my ATE research contained 23 such items, and I estimated it would take about 15 minutes to complete. Although I was evaluating ATE sustainability, ATE team leaders could use the process to evaluate their program or individual products and activities. Further information on the details of the procedure can be found in Welch, W. W. (2011). A study of the impact of the advanced technological education program. This study is available from University of Colorado’s DECA Project.